Credit Suisse raised its year-end forecast for the S&P 500 to 3,025 from 2,925. The bank's chief U.S. equity strategist, Jonathan Golub, said the "receding" risks will drive the market higher. "Less hawkish comments from the Fed, declining inflation and recession fears, and the potential for a resolution to China trade issues are the primary forces driving volatility and spreads lower, and stocks higher," Golub said. Underneath the stock market's epic rebound has been a "more favorable" trend that Credit Suisse says will drive the market higher. The bank dialed up its year-end forecast for the S&P 500 to 3,025 from 2,925 previously. The new outlook calls for a gain of more than 20 percent for full-year 2019 or more than 7 percent from current levels after the big rally to start the year. It would also be the stock market's best year since 2013. That is because all the market risks that tanked stocks in December are now "receding," according to Credit Suisse's chief U.S. equity strategist, Jonathan Golub. "Investors might be pleased with the market's recent performance, but it's unlikely they find the underlying dynamics—a more favorable risk backdrop, with decelerating economic and earnings growth—particularly inspiring," Golub said. "More specifically, less hawkish comments from the Fed, declining inflation and recession fears, and the potential for a resolution to China trade issues are the primary forces driving volatility and spreads lower, and stocks higher," he added. 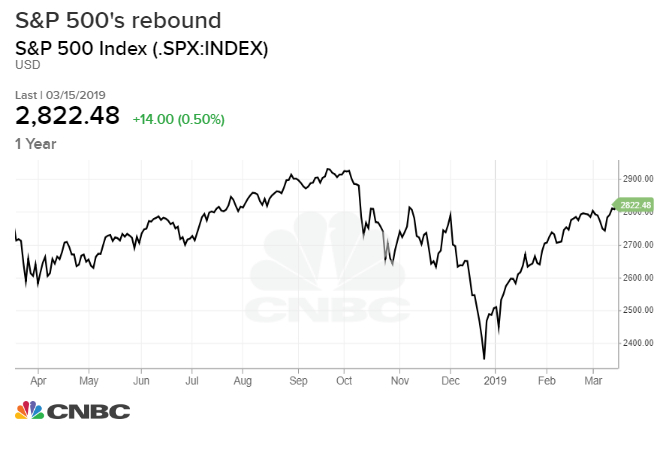 The market has staged a strong comeback with the S&P 500 up 20 percent from its Christmas Eve low when it dipped into a bear market on an intraday basis. Many have credited the massive sell-off to fears of a too-aggressive Federal Reserve and a possible recession. Now with the central bank signaling a "patient" approach to tightening and better-than-expected economic data, the rally may have more room to run. The average S&P 500 target from the 17 top Wall Street analysts is 2,947, a CNBC analysis shows. Credit Suisse actually lowered its 2019 earnings estimates for S&P 500 companies to $170 from $174 despite raising its stock price outlook. The firm says the reduced estimates are due to lower oil prices and large tech companies' worsening outlooks. "We are lowering our estimates solely to reflect the decline in projections for the energy sector and Apple," Golub said. Credit Suisse's new estimates represent an earnings growth rate of 4.4 percent in 2019, versus the Street's consensus of 3.8 percent growth this year, according to FactSet. With the Fed on hold and a trade deal in sight, that should be enough to lift the market despite the weaker earnings outlook. The bank also noted low bond yields are implying a "much higher" market multiple. The forward price-earnings ratio for the S&P 500 is currently at 16.4 times, while the low rates are pointing to 20.4 times, the bank said. "Our work indicates that investors have not fully re-risked portfolios following 4Q's turbulence—despite a sharp decline in volatility and spreads—and that valuations will drift higher as they do so," Golub said.